Name meaning 'bearded' or 'with long hairs' referring to the dense hairs all over the plant. Shrubs to small trees up to 12 m high, dbh up to 15 cm, monoecious or dioecious. Indumentum densely hairy, very soft-floccose, flocci up to 6 mm long. Stipules linear-triangular, 10–17 by 0.8–1.2 mm. Leaves alternate to apically subopposite; petiole 3–40 by 2–7 mm, blade peltate for 10–80 mm, broadly ovate to ovate, 10.5–58 by 9–45 cm, length/width ratio 1–1.3, base truncate, rounded or obtuse, margin dentate, sometimes 2-lobed at widest part of blade, longest lobes up to 50 mm, basally with 0–4 extrafloral nectaries, marginal nectaries 0–9 per side, lower surface brownish green, palminerved. Inflorescences terminal, unisexual or bisexual. Staminate inflorescences up to 65 cm long, side branches up to 30 cm long, with 2 or 3 flowers per node, nodes per branch up to 130. Staminate flowers 6–9 mm diam. ; pedicels 3–5.5 mm long; sepals 4 or 5, 3–5 by 1.3–3 mm, pale light cream to tan cream; stamens 60–85, pale light green to yellow. Pistillate inflorescences racemes, up to 55 cm long, occasionally with side branches, up to 10 cm long, nodes up to 80. Pistillate flowers 4–6 mm diam. ; pedicels 1–45 mm long; calyx (3-) or 4- or 5- or (6-)lobed, connate on the base, 2.5–5 mm long, lobes 2–3 by 1.5–2.5 mm; ovary 3(–5)-locular; style up to 1.5 mm long; stigmas 2–6 mm long, yellow. 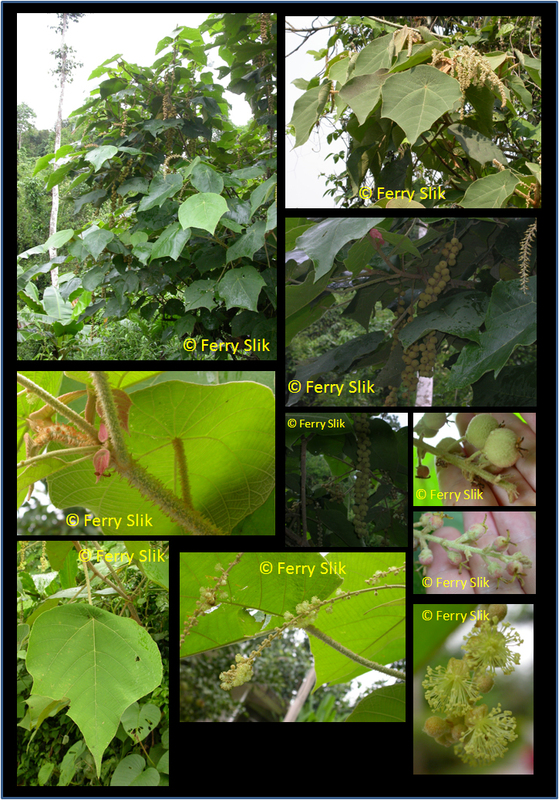 Fruit 10–21 by 14–20 mm, with strong smell, yellow with reddish touch, spines numerous, straight, thin, less hairy, up to 7 mm long, hairs forming a continuous layer, rubbing off. Seeds ellipsoid, 4.8–5.5 by 3–4.5 by 2–4 mm, surface smooth, black. Locally common in deciduous and evergreen forest, mostly in open, often very disturbed or burned places, along road and river sides; on a large variety of soil types, like shale, limestone, sandstone, and sandy clay. Altitude: sea level up to 1400 m.
From India (W Bengal) to South China, Southeast Asia mainland, Malay Peninsula, Sumatra, and Java. The roots and fruits are used against muscle stiffness. The seeds yield a fatty oil used for making candles. Peninsular Malaysia: Baleh anging, Ba-le-a-nging, Balek angin, Balik angin, Tampun.